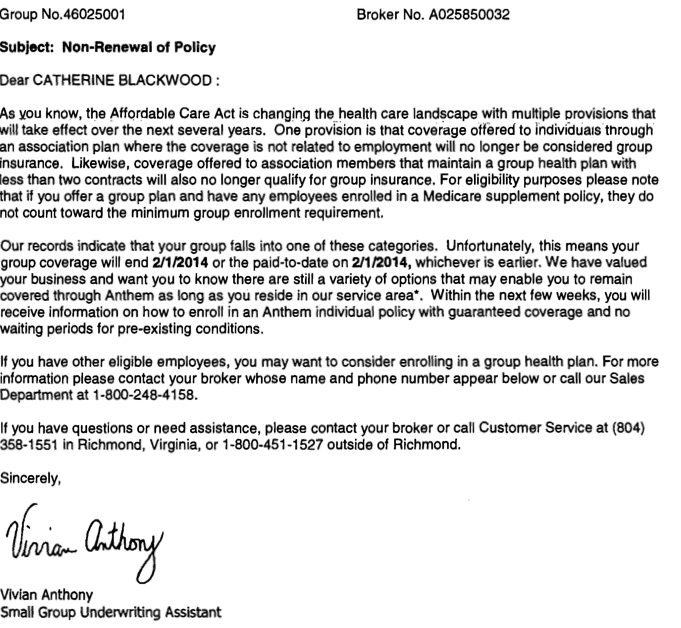 Catherine Blackwood is counted as a success in the statistics touted by the Obama administration as it continues to peddle Obamacare. She has procured new Obamacare-compliant health insurance. Struggling with carcinoid cancer since 2005, Mrs. Blackwood treats her health insurance as a matter of life and death. In November, along with millions of other Americans, she lost her health insurance. She’d had a Blue Cross/Blue Shield plan for nearly 20 years. It was expensive, but given that it covered her very expensive treatment, it was a terrific plan. It gave her access to any specialist or surgeon, and to the Sandostatin and other medications that were keeping her alive. Because the exchange website in her state (Virginia) was not working, she went directly to insurers’ websites and telephoned them, one by one, over dozens of hours. As a medical-office manager, she had decades of experience navigating the enormous problems of even our pre-ObamaCare system. But nothing could have prepared her for the bureaucratic morass she now had to traverse…. Go to Mr. Blackwood’s column for the rest of the unhappy story. I read with pleasure Scott Johnson’s recent piece, “Hiltzik’s Greatest Hitz,” which rebuts very effectively Hiltzik’s hasty attempt at debunking my account in last Monday’s WSJ of my mother’s difficulties under the ACA. Johnson is quite right to point to the question of why, exactly, my mother lost her insurance in the first place. We intend to make the letter of cancellation public, just as a matter of record: it outlines specifically what provisions of the law required the cancellation of her old plan. I asked Mr. Blackwood for a copy of the letter to post on Power Line. This week he kindly forwarded a copy of the letter (screenshot below). NOTE: Rep. Randy Forbes take up Mrs. Blackwood’s story in “A real story of Obamacare.” More on the Blackwood family and their struggle on behalf of Mrs. Blackwood is posted at Blackwood Caring.